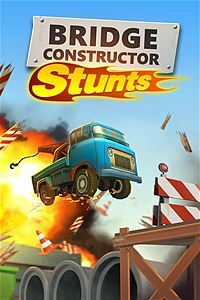 Bridge Constructor Stunts feels like a mix of the “Trials” series and bridge building PC games from the 90’s. It attempts to take those two game play mechanics to mesh them into one game. It’s a cool concept and in theory it sounds like it could be fun. Building bridges and ramps to skillfully launch yourself through levels seems like a nice idea; but in reality what we have here is a game that feels unfinished and like it would be found on flash gaming websites in 2002. The gameplay of Bridge Constructor Stunts (BCS) is quite simple. Build bridges and ramps through the creation tools and then get to the end of the level by driving through to the end. BCS’ game modes are very lacking. The only option for playing the game is simply the classic level 1 world 1 type format. When you beat level 1 you move onto level 2. When you beat level 2 you move onto level 3. Once you complete a world you move onto world 2 and so on and so forth. I was honestly surprised when I saw this and it instantly reminded me of the mobile game market today, it doesn’t feel like an Xbox One game. The game was initially on mobile, but why not update the game when you bring it to home consoles? Why is there no creation game mode? I don’t see why this game couldn’t have a gamemode where we have empty worlds where the creator could build whole levels to replay or send to friends through Xbox Live. Each level feels like a tutorial, as the game adds a new gameplay mechanic often, like steel beams, wires, and “no-build” zones. Giving me one gameplay twist at a time and letting me master one thing at a time is smart, but when I’m playing level 6 of world 2 and I’m still being introduced to new things, it starts to get old. At some point the game just needs to give me full reigns. And it takes a long time to get there, it feels like a VERY LONG tutorial. The best way to teach a player how to play a game is naturally through the gameplay. In BCS whenever I’m introduced to something new I get some boring text that says, “here’s this new thing and here’s the very specific way we want you to use it to get through this level”. That’s not fun and it doesn’t properly teach the gameplay mechanic in a natural way. When I finally get to levels that let me play with all the tools, I still felt limited. The level design is such that it feels like there’s only a few ways to properly build, and that’s just the opposite feel of what creation is. Building should be something I intuitively do and find my own way to complete the task, instead it feels like the levels have specific options on how to get past the obstacle. It’s just not fun. The building tools and the controls on how to use them work great. In general the building aspect of the game is its strongest point. If I could just have an empty level to use the creation tools, I would genuinely have fun. There are also smart options like a “simulation” button where you can test out the bridge’s or ramps’ structure to make sure they hold up before actually playing through. Driving with the trucks is a mess. The button layout is ancient, no one presses A to accelerate anymore, but that’s how BCS handles it. The B button is breaking. Why RT and LT don’t handle these features is beyond me! It feels like I jumped into a portal to 2005! Also you can’t drive backwards. This is insane to me because it looks like some of the levels are designed with driving backwards in mind but it’s just not a feature, which is ridiculous! The truck feels very light and airy, it just feels off. And accelerating feels sloppy at best, having the tactile control of the RT button would have fixed this easily. The graphics are also hideous. I’m not gonna sugar coat it, it’s an absolutely disgusting looking game. There’s no need to go into detail about this because the developer seemed to not care about detail either. The simple music that plays during the building moments of the game is nice, but it’s jarring that whenever I pressed the “simulation” button to test out my work the music resets, it instantly takes me out of that tranquil mood of just building and having fun. The music when you drive around is terrible, it’s some crazy over the top rocky sounding song that again sounds super dated. Overall developer Headup Games has a really cool idea here. And honestly the tools in the building mechanics of the game are really neat! I wish the game did a better job of teaching me the mechanics without stretching out that tutorial over dozens of levels. I took one peak at the trailer of the game and suddenly I learned more about the building features and how to tackle tricky spots than the actual game taught me itself. The driving aspect of the game is just not good. In my opinion the game would have been significantly better if they honed down on the building mechanics and just let the AI drive the trucks around. This way I could learn the minor tweaks I needed to make to adjust ramps and bridges and not worry about the sloppy driving controls. If you LOVE to build things and like the idea of grinding through level by level and mastering each challenge than you might have found a decent game here. However I highly recommend the $3 mobile version because the price tag and lack of new features on the Xbox One version just isn’t worth a buy.